We had my parents over for dinner tonight so I took the opportunity to try out a new appetizer. - Saute 1/2 of a chopped yellow onion and 4 cloves minced garlic in olive oil. - Put 2 cans of drained garbanzo beans (chic peas) in a food processor. Add cooked onions, garlic, 2 cloves minced raw garlic, about 2 tablespoons of olive oil, a few shakes of red pepper flakes, approximately 1.5 teaspoons salt (just do it to taste - you can always add more later) and the juice of 1/2 of a lime. Blend until smooth. 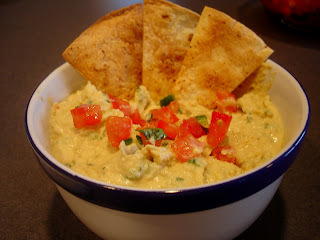 - Put the hummus mixture in a bowl and stir in 2 chopped green onions, 1 chopped jalapeno, a few dashes of Tabasco, cayenne pepper, chili powder, and cumin. - Once all of that is mixed together, stir in about 3 tablespoons of sour cream. - Cover and chill for a few hours. Once you are ready to serve it, stir it again and adjust any of the seasonings. I topped mine with tomatoes, but you could also mix them in. When I was making this I really wasn't sure about it - it tasted very sweet and sort of blah. But once it sat in the fridge for a few hours it was great!! We all loved it! What goes better with a homemade dip? Homemade chips!! Well, semi-homemade (God, I sound like Sandra Lee) since I didn't make the tortilla shells, but that's something on my to-do list for this year. 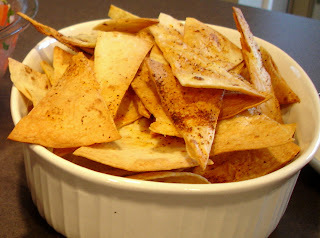 I took 8 soft tortilla shells and brushed them with olive oil. I sprinkled just a tiny bit of salt, cumin, chili powder, and onion powder on each one. Pile them up and slice like a pizza. Spread the pieces on a cookie sheet and bake on 400 for about 7 minutes. Be sure to watch them - once they get crispy they will really burn quickly. Mine turned out a beautiful golden brown. For dinner Jon grilled some sirloin steaks that he had marinated in a Guinness Marinade for red meat that my sister brought home to us from her trip to Ireland. He put some salt, pepper, and onion powder on the steaks first and then let them relax in the marinade for a few hours before grilling them. Poor guy had to grill the steaks in the pouring rain, but even with the conditions he was able to make them look beautiful and taste great - look at those perfect grill marks! I made my favorite side dish - garlic parmesan/romano risotto - and some roasted asparagus to go along with the steak. My parents tried a dessert recipe that they found in the latest issue of Kraft's food and family magazine. It was a no-bake berry cheesecake with a graham cracker crust. It was really yummy and light which was perfect after a heavy meal. It's going to be a busy week this week so I doubt I'll be trying anything new that I can post over the next few days, but you never know. Have a great week! You used the Guinness marinade! How was it? Yum! Now I'm craving steak! 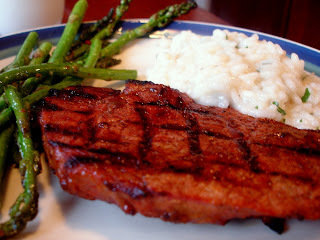 ps - I wish I could make grill marks like those!